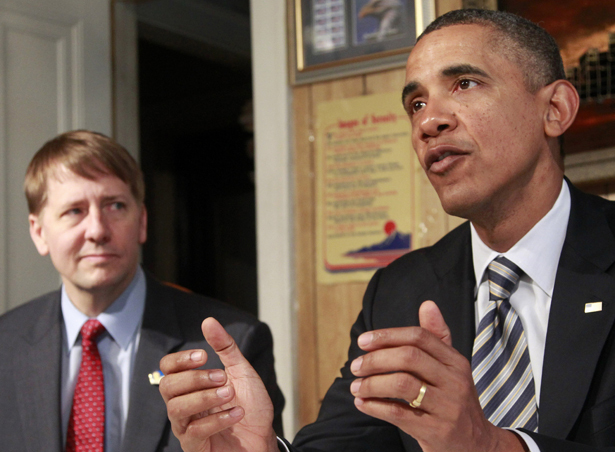 President Obama installed Richard Cordray as head of the CFPB today—and prepared for battle with Republicans over consumer protection from financial predators. Yesterday, the Washington Post reported that President Obama’s 2012 election strategy would feature a White House battle against an unpopular and intransigent Congress. Today, the administration fired the first shot. Obama announced this morning his intention to use a recess appointment to nominate Richard Cordray to head the Consumer Financial Protection Bureau, the new regulatory agency that was created by the Dodd-Frank legislation but has been leaderless since the summer because of Republican obstruction in the Senate. “Today, I am appointing Richard as America’s consumer watchdog,” Obama said at a raucous event in Shaker Heights, Ohio, with Cordray at his side. Recess appointments are common ways for presidents to install nominees the Senate won’t confirm. So common, in fact, that Republicans took pre-emptive measures and wouldn’t allow Congress to actually go on recess during this break—they held meaningless “pro forma” sessions at least every three days, where the session would be gaveled in and then gaveled out just as quickly. But Obama went ahead and nominated Cordray anyhow. While the Justice Department under Bill Clinton said that Congress must be out of session for three days in order for a recess appointment to be valid, the White House rationale is that the entire pro-forma maneuvering is a “gimmick,” in the words of White House communications director Dan Pfieffer, and no such three-day timeframe exists. “The Constitution, on its face, does not establish a minimum time that an authorized break in the Senate must last to give legal force to the President’s appointment power under the Recess Appointments Clause. And we do not set the limit today,” [the decision said]. Beyond the legal technicalities, Obama is gambling that people won’t care much about inside-the-Beltway procedurals and will favor his aggressive move to make the CFPB fully operational. The agency enjoys approval ratings of 74 percent, and when Cordray takes office it will allow the agency to go after non-bank institutions, like predatory payday lenders. Cleveland, I know you’re hearing a lot of promises from a lot of politicians lately. But today, you’re only going to hear one from me. As long as I have the privilege of serving as your president, I promise to do everything I can, every day, to make this country a place where hard work and responsibility mean something—where everyone can get ahead, not just those at the very top or those who know how to work the system. That’s what America has always been about. That’s what today is all about. And with the help of people like Richard, that’s the country I believe we can be once again. For years now, progressives have been urging Obama to play hardball with the Republicans in Congress who love that game so much. Republicans have escalated use of the filibuster to historic levels, blocking nearly 20 percent of Obama nominees—and have paid little, if any, political price for using complicated Congressional maneuvers. Now the White House is engaging on that same battlefield of arcana—with a much stronger core message. But Representative Barney Frank, a longtime proponent of the CFPB, dismissed those comments earlier today. “Republicans’ complaints about the President’s decision to make this recess appointment are equivalent to objections leveled by arsonists at people who use the fire door to escape a burning building,” he said in a statement. This is an argument Democrats clearly feel poised to win. UPDATE:Obama doubled down on his battle with Republican obstructionists in the Senate by recess-appointing three members to the National Labor Relations Board this afternoon under the same reasoning used to justify Cordray’s appointment. Sharon Block, Terence Flynn, and Richard Griffin are now poised to take seats on the NLRB this week. Conservatives may fairly argue that since these appointments were only made in December, the Senate hasn’t had a fair chance to even take them up, and so the recess appointment is a particularly daring "bull-rush," in the words of the National Review. But the GOP blocked Obama’s last appointment to the NLRB and these three would absolutely have faced the same fate–and if no action was taken, the NLRB would actually shut down due to failure to reach quorom, since Obama’s last recess appointment to the board expired at the end of 2011. That would have left only two NLRB members, which is not enough to perform its duties.